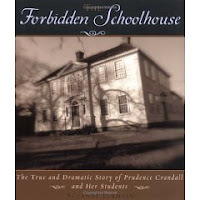 In 1831 Prudence Crandall opened a boarding house for girls. She was a very intelligent lady and well-to-do students from her hometown of Canterbury, CT clamored to attend her school. Then one day, a young African-American girl asked Miss Crandall's permission to attend the school. Prudence was an abolitionist and strongly believed that African Americans deserved the same opportunities as white people. After some thought on the matter, Prudence allowed Sarah Harris to join the school. Immediately there was outrage in the small Connecticut town. White parents did not want their daughters to go to school with black girls. So Prudence decided to open a school just for black girls. The town was against her. People protested the school, even going so far as to pass a law saying that it was illegal for African-Americans from other states to go to school in Connecticut. They threw rotten eggs and rocks at the windows of the school. They blacklisted Prudence Crandall and local shopkeepers refused to sell her groceries or supplies. Through it all, Prudence Crandall fought for what she believed in. She went to jail for her school, but she would not shut it down. This is an inspiring story about a spunky woman who would not give up her principles. It would make an interesting addition to any unit on slavery/abolitionists or women's history. This book won a 2006 Orbis Pictus Honor (an award given by the National Council for Teachers of English for outstanding nonfiction books for children). In addition to extensive source notes, the author also includes an appendix that explains what happened to the pupils at the school and the other people mentioned in the story. A lengthy bibliography and an index round out this excellent reference title. Happy Nonfiction Monday! As always, be sure and check out the great posts collected over at Picture Book of the Day.